As a result of the 1975 Centennial Celebration and the 2003 Mission Study, a complete history of the church is available as an Adobe Document (29 KB in pdf format) by clicking on the link below. 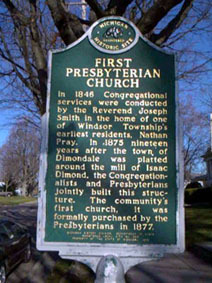 The First Presbyterian Church of Dimondale traces its history back through the early days of settlement in the area around Dimondale, Michigan and Windsor Township. From 1837 onward the people have shown religious interest. The Pray Circle was composed of men and women joined together for prayer. A group called the “Windsor Aid” was formed in 1839 to help those in need. Circuit riders conducted worship services. As early as 1846 Congregational minister Rev. Joseph Warren Smith of Eaton Rapids, Michigan met with Nathan H. Pray to organize regular church services. 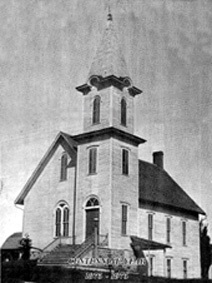 In February 1875, the Congregational Church began the building on the site of the present First Presbyterian Church of Dimondale. On June 11, 1875 a Commission of the Presbytery of Lansing founded the Presbyterian Church at the Skinner School House. Thus the First Presbyterian Church of Windsor was founded. They met in various places between 1875 – 1877, such as The Little Brown Jug School, Olivers Hall, and the School House located by the cemetery. On October 21, 1877, a grant of $700 from the Presbyterian Erection Fund of the General Assembly permitted the Presbyterian Church of Windsor to purchase the partially completed Congregational Church building. On February 6, 1878 the First Presbyterian Church of Dimondale was officially dedicated by a Commission of the Presbytery of Lansing. The building was expanded in three projects. In 1946 a basement was added for Sunday School rooms in the back part of the church property. In 1966-67 a second floor was added over the back part of the building and much of the total building was remodeled. In 1988 the size of the building was doubled and most of the old building redesigned. The steeple was replaced on the tower. The project cost was $560,000 and the money came from the General Assembly, Synod of the Covenant, Presbytery of Lake Michigan, local funds and bank loans to complete this building program. Our church is now ready to meet the 21st century with a vastly improved physical plant. As we catch the vision of God’s plan for our church, the future will be as bright as our historical past. Our visions over the years have led us to new heights. It has given us a newer and better building. Our giving to general operations, missions, and debt retirement places us as one of the leading churches in our Presbytery in per member giving. Our church hosts many functions and serves the community well. 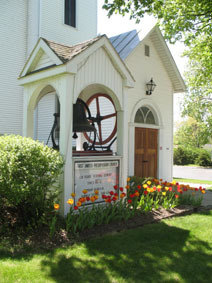 Our carillon bells have proclaimed God’s glory in the Village of Dimondale since 1946, while our church programs continue to carry on our declaration of rejoicing God. In reviewing the history of our church we have found that a host of people are very dedicated to the First Presbyterian Church of Dimondale. It stands as a historic tribute and record of people, young and old, serving the Lord Jesus Christ. Over the past 136 years, people have joined together their hopes and ambitions, their works and efforts, and with the help of God produced a witness ready to move our church forward with hope and faith.